This piece was done from a photograph. What I merely created was capture the colours and tonal values. 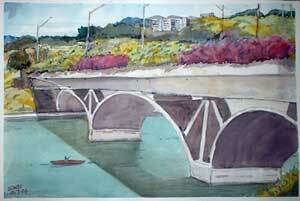 It is a painting of a bridge over the Putrajaya Lake. the arches are beautiful and so are the red and green flowering plants planted on both sides of the bridge which you can see overhanging from the sides. The man in the canoe is paddling into the archway. ur illustrations are so lovely.